You may send email to families, employees or vendors (with or without attachments) directly through Procare. Before you send email through Procare you must Set Up Email Options. The steps below are for email sent to families, however the process is nearly identical when sending email to employees or vendor contact people. Optional: Use the Select Filter to include only families to whom you wish to send this email, such as those with children in a certain classroom. You’ll be able to choose individual people from the filtered list before sending the email. 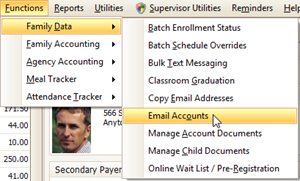 From the main screen of Family Data & Accounting click Functions > Family Data > Email Accounts. Note: From Employee Data go to Functions > Email Employees. From Expenses & Ledger go to Functions > Email Vendors. In the Email Message box type the actual text that will appear in the body of the email. If you are attaching a file it’s a good practice to mention it in the message like: “Attached please see the announcement for our Spring Carnival”. To attach a file (optional) click the paper clip button and browse to the location of the file on your computer, such as a .pdf, word document, etc. Only one item can be attached per email. Hint: You may need to choose All files (*. *) as the file type if you are attaching something other than a .pdf. Select the people to whom you wish to send this email. For families you may select the Primary and/or Secondary Payers (usually mom and dad). Check the box at the top of the column to select everyone in that column. Note: Names shown in pink/red either do not have an email address at all or the address is not in a valid format. These people cannot be selected. 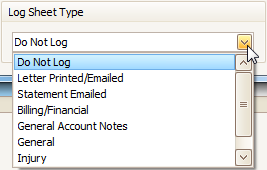 Select a Log Sheet Type (optional) like “Letter Printed/Emailed” if you want a record of sending this email entered on the Log Sheet of each account. Note: The contents of the email is not recorded in the log, just the fact that the email was sent. Note 1: A record of the message should appear in your email “Sent” folder. The message is sent as a Blind Carbon Copy (BCC) so people receiving the text cannot see anyone else to whom it was sent and just one email appears in your “Sent” folder. Note 2: If you are using Outlook, you may get a message that a program is trying to send email on your behalf. Be sure to answer Yes. You may find that Outlooks asks repeatedly for permission to send each individual email. This is a function of Outlook and is not controlled by Procare. However, you may choose to install a third party utility. See article Advanced Settings for Outlook. Why would I change the BCC email address count?